What do Childcare Centres offer for children? During the initial rise of two-income families, childcare centres were viewed as a necessity. When both parents need to work to get by financially, they need someone else to take care of the kids while they are at work. Childcare centres are especially useful for single parents who may not have the capacity to raise a child and hold a job at the same time. At Kinda-Mindi, we offer childcare services for children aged 6 weeks to 6 years. Guided by the Early Years Learning Framework, we strive to foster “The Curious Child”. To learn more about our childcare services, visit our centres located in Kellyville, Kellyville North, Castle Hill and Glendenning or accomplish our contact form for more information. As time went by, childcare centres have grown beyond their initial purpose of taking care of children during work hours. Recent scientific research has proven the value of early childhood education as learning and mental development begin immediately after birth. Essential neural development occurs during the first three years of a child’s life. Early education even before kindergarten can be beneficial to take advantage of these crucial years. So what do childcare centres offer for children? Childcare centres provide an effective avenue for social interaction between children and their peers as well as adults. These types of social interactions provide huge learning opportunities that are important for cognitive and emotional development. A socially interactive environment helps children develop their language skills, encourage creativity and imagination, and improve social intelligence and self-esteem. By playing with their peers, they could learn how to share and work together to solve problems. Social interaction with adults will help children recognise them as authority figures that could provide positive guidance. Children benefit from a slate of activities each day. From songs to storytelling, young kids will never get bored from all the play time that they have. High-quality childcare centres use play-based learning as the cornerstone of their curriculum because of its huge impact on cognitive development. Play is actually how young children explore and learn about the world around them. The transition from home life to school can be very challenging for both parent and child. Being in a strange place with unfamiliar people can make a child feel anxious. Childcare centres ease this transition as they help children develop the skills and the mindset that is essential for big school early on. This helps them adapt more quickly to the new environment without any issue. These are just some of the benefits of childcare centres. If you want to learn more about the other benefits of childcare centres, we’ll be glad to answer your concerns. You may contact our centres near you or complete our contact form for more information. 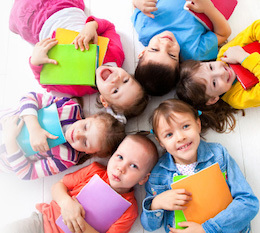 How to evaluate Child Care Centres? Learning Through Play Kinda-Mindi provides a play based learning environment to support children’s understanding, skills and abilities. Kinda-Mindi Early Learning Centre is a family owned and operated child care provider catering for children from 6 weeks to 6 years of age. Our educators are passionate about educating and caring for the children in our care. All educators at the centre are highly trained and qualified. Kinda-Mindi provides a play based learning environment to support children’s understanding, skills and abilities. Newsletter Signup Stay tuned with Kinda-Mindi’s latest news. We usually have children on holidays during this time so if you need casual days, contact your service. As Kinda-Mindi is closed, we do not charge families for public holidays! Each year, we take our school leavers to Featherdale Wildlife Park as a graduation gift. Graduates from all four centres and their families are invited to join us. More information on times and scheduling to come soon!